I Am Not a Restaurant | I Am Not A Restaurant! “I am not a restaurant!” But I play one in my kitchen, and the whole family calls me on it, both individually and occasionally as a group. Not Merlin, just Mom the magical food mill. You don’t like the frittata? Okay, how about pasta fagioli? Would you like Mommy to peel the skins from the grapes? Freeze them? Make jam, a tart, a savory fish with champagne (ok – prosecco, recession’s sparkler). Though not a kitchen tech enthusiast I have a dehydrator, a spaetzle maker, an ice cream machine, pizza stone, 2 Ninja systems (! ), and a still boxed sous vide that is supposed to knock the socks off chicken cooked any other way. Seriously after nearly 17 years of family food management, I finally understand why my parents celebrated the last child’s entrance into college by dining out nightly. Hence, my newly typed lament, “”IAmNotARestaurant.com”. I just want to get the food on the table with some grace most days. As a home and lifestyle host on Martha Stewart Living Radio on SiriusXM for the past 7 plus years, I have fielded the same questions, “what should I make with…chicken…ground beef…broccoli?” And I answer…honey mustard, beer battered, oven fried…empanadas…pasta with garlic. But like a metal stamping factory during economic recovery, the same question for all of us continues. The thing is, beneath my carmelized, crusty exterior, I still like it. Knowing I can whip together a marinara in 15 minutes gives me great satisfaction plus the hope that I can stuff them full of vegetables before they fledge. So on IAmNotARestaurant.com I will share. Recipes will be original and borrowed, health conscious and spoilers. They will have worked for mine, and I hope they work for yours too! 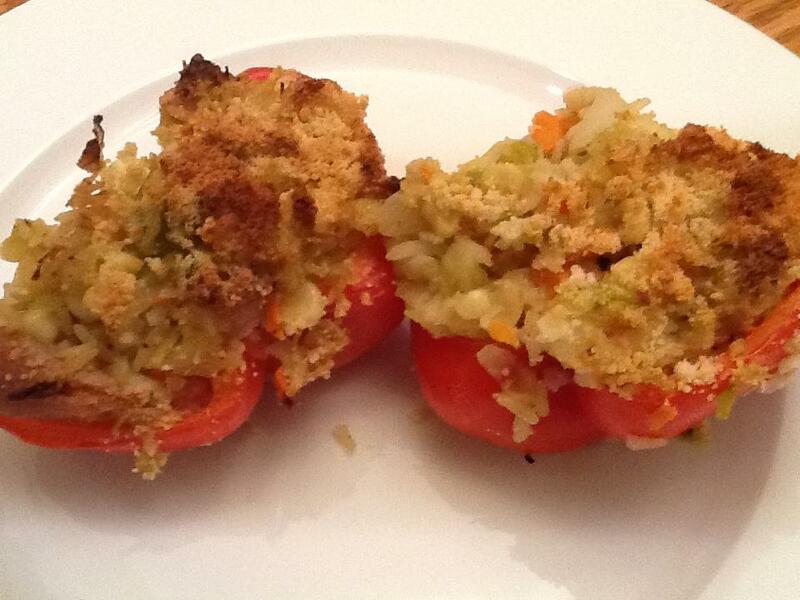 Try the stuffed peppers and feel free to make them your own! Change the seasonings, make them meat free, add tomatoes!! This is a great way to plan for and use leftovers. Reserve the peppers in an oiled casserole for stuffing. Soften the other veggies in a touch of olive oil over medium low heat. Season with salt and pepper. Add other spices, cook a minute or two, then add corn and chicken. Add the cheese, stuff the peppers, top with more cheese. Bake at 400 for 30 minutes. Eat.